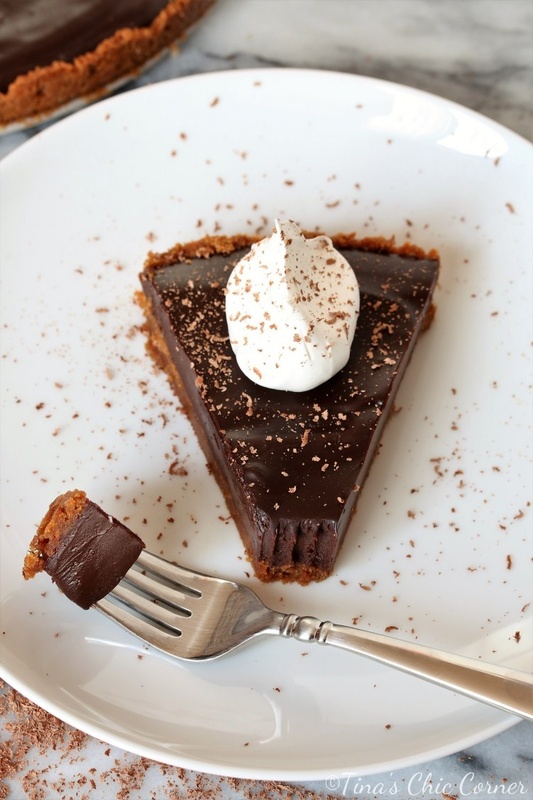 Guys, I’m so obsessed with this tart and I know that you will be too! I only make a cake or pie when I know that I have a crowd to serve it to. My husband and I would happily devour it ourselves, but our waistlines would not like that. So when the holiday hosting season kicks in, I’m excited to try some new desserts. 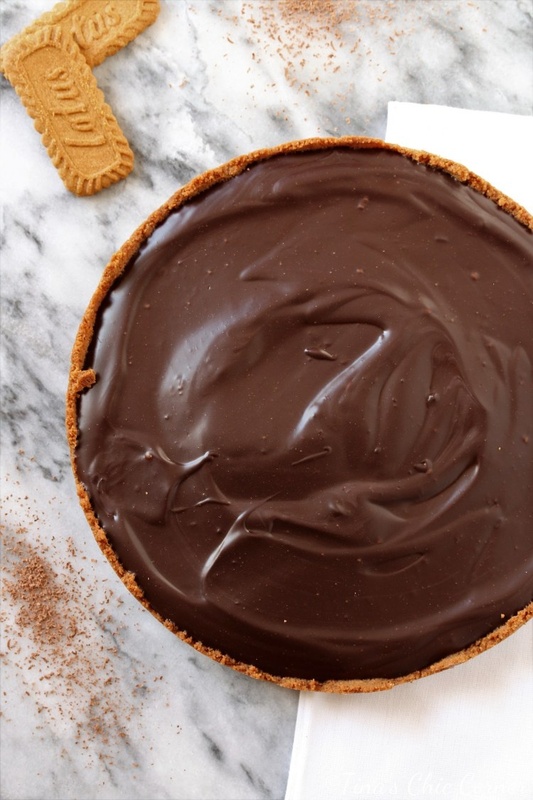 This cookie crust is amazing enough to eat on its own. When the crust was baking, my husband said that the house smelled amazing. Actually, this is the only part of the tart that you bake. You’ll see in the directions. I used Biscoff cookies (aka the cookies that a popular airline tends to serve as a snack) for the crust. If you’ve never had this cookie before, they are like a sugar cookie with warm spices. Warm spices are perfect this time of the year. You could use graham crackers instead if that’s what you prefer or can’t find the Biscoff cookies where you live. 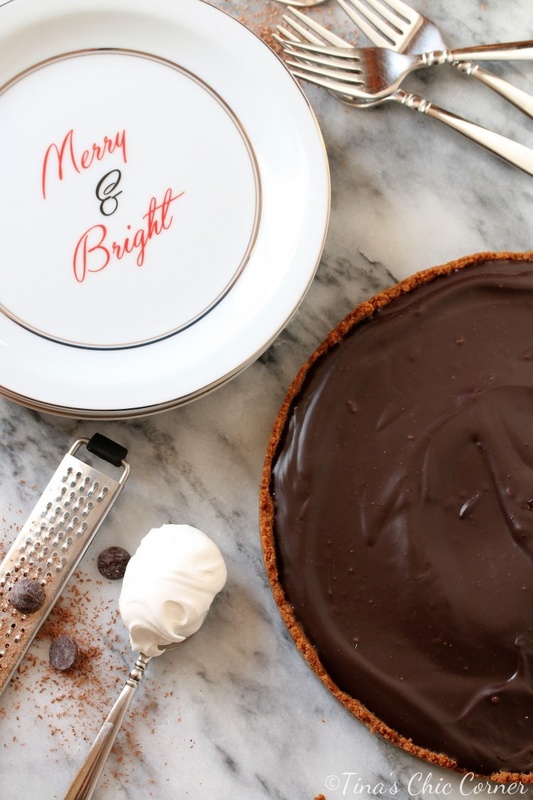 Bonus points that this tart is super duper easy to make and you only need a few ingredients. It took me about 30 minutes to make it. Do you see why I’m obsessed with this chocolate delight? 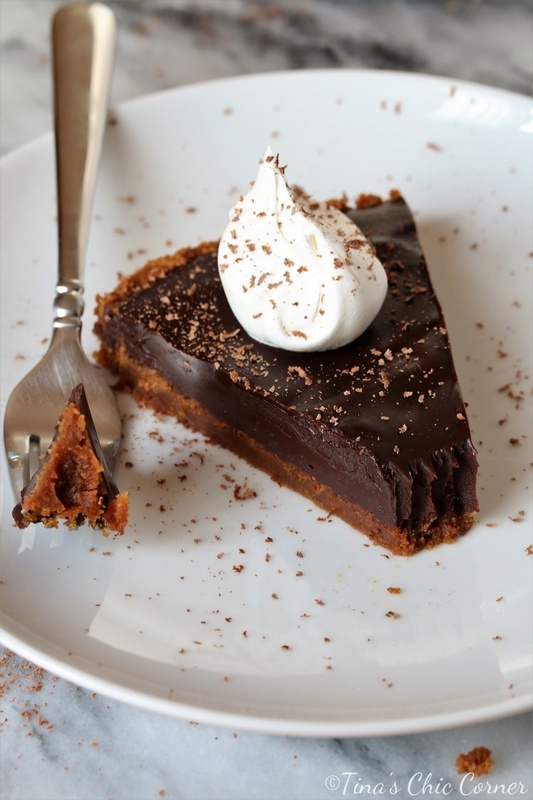 I served the tart with whipped cream and chocolate shavings. If you know me then you know I’m all about the presentation. The friends I made it for loved it. In fact, they’ve already requested that I make it for our next holiday gathering. I guess that puts a wrench in trying something new next year, at least for when they come over. I can’t complain because it just means that I found a real winner. Preheat the oven to 350 degrees F. Use cooking spray to grease a 9 inch tart pan, 9 inch springform pan, or 9 inch pie plate. If you want to serve the tart on a dish, then you must use the tart pan or springform pan. Otherwise you’ll be serving it out of the pan. In a food processor, blend the cookies until they are fine crumbs. Add the room temperature butter and blend until all of the ingredients are combined. Press the cookie crumb mixture into the bottom of the prepared pan. 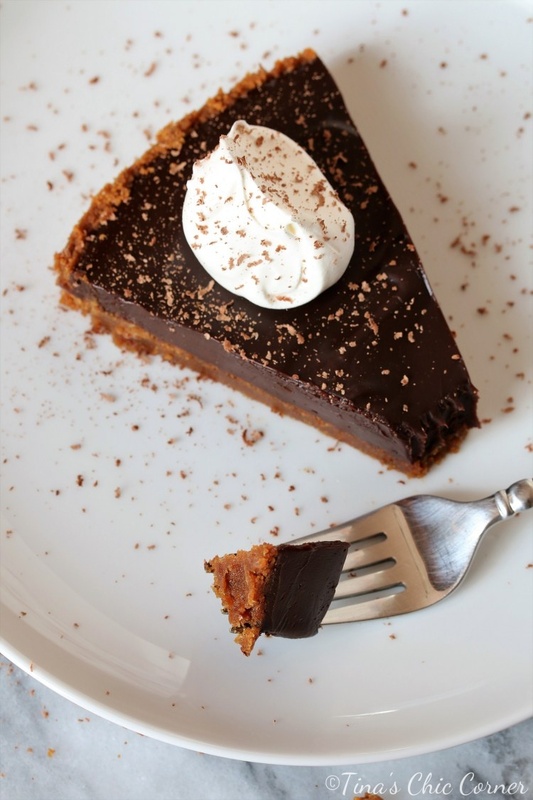 If you are using a tart pan, press the cookie crumbs up the sides to the top. If you are using a springform pan or pie plate, press the cookie crumbs up the sides about a 1/2 to 1 inch. I used a 1/2 cup measuring cup to help pack the crumbs down firmly. Bake the crust in the preheated oven for 10 minutes or until the crust looks like it’s gotten darker in color. I baked mine for 12 minutes. To make the filling, put the dark chocolate chips, heavy cream, and salt in a small pot. Place it on the stove on medium heat and whisk it until it’s smooth and the chocolate has completely melted. Pour the filling into the cooked pie crust and let it cool. I let it sit on the counter for a few hours and then chilled it overnight in the fridge. 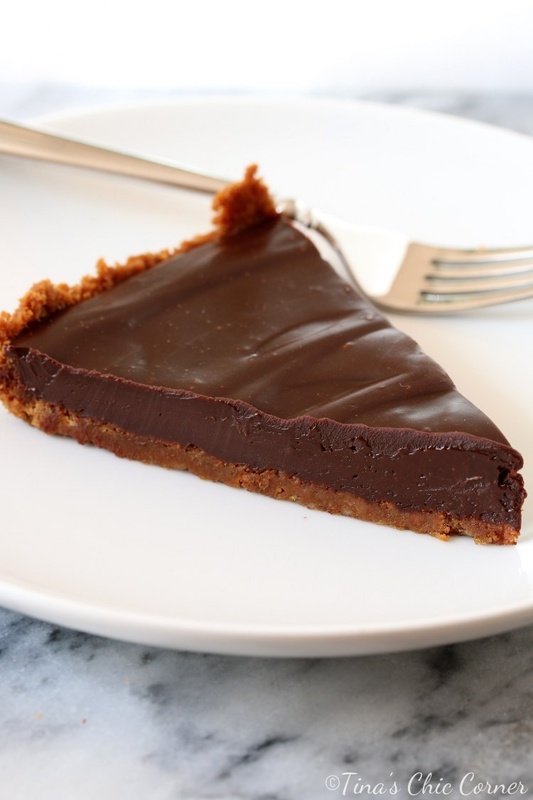 You can eat the tart straight from the fridge, but I recommend taking it out about an hour before serving it because it will be easier to cut and have a more pleasant and softer texture. I served it with a dollop of whipped cream and dark chocolate shavings.